This crotch crusher has elevated the voice of many a post pubescent male over the years as they walk back from the pub on a moonless night. 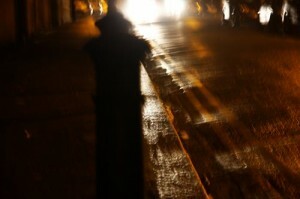 There is no street lighting and the area can be quite foggy during autumn nights. 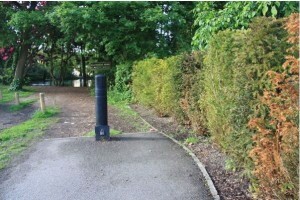 It may have been put there to stop drivers driving along the footpath and ending up in the pond but being all on its lonesome this black lump of metal is as effective as blind goalie. A driver intent in dunking his car could drive round it. Perhaps the Council could paint it white or remove it altogether? 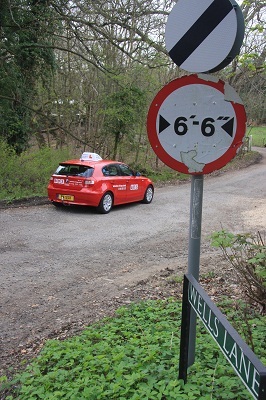 20 mph speed limits have been imposed on large areas of Britain, including the road in Ascot I photographed last month. I never got a reply from the mildly chastising letter I wrote to the Council but success all the same. Remember the newly erected 30 mph speed limit signs appeared just before the limit was to be reduced to 20? The ugly speed limit signs have been removed – almost before the concrete had hardened. 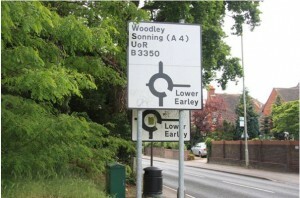 The following signs were found in Reading. I think that there must have been a “Buy one, get one free” offer on at the time of installation. The government has stopped governing and parties of all persuasions will be ramping up the propaganda to get us to vote for them next month. No doubt those charged with corruption willl be making a last raid on the offices we have provided for them and making off with anything they can lay their hands upon. Ebay will be busy! de-restricted sign on what is little more than a cart track! 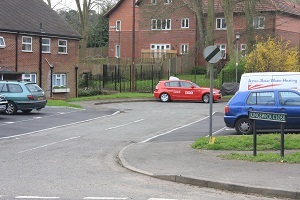 Chicane built on a bend in Fernbank Road near ‘Daisies’ and then removed. 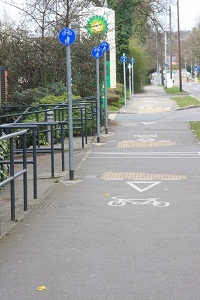 Poles put up for road signs when another pole is very close by resulting in extra road furniture. ‘No Pedestrians’ sign erected on a footpath by a seat and bus stop by Lyndale nursing home, this was removed a few months later. Corrogated road surfaces placed by houses and old people’s homes designed to slow traffic but kept residents awake at night because of the noise. 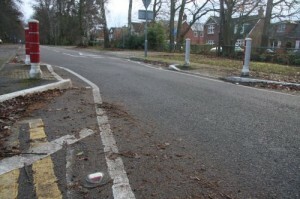 Large ugly barrier erected at the ‘Sperry’ roundabout. Traffic lights wired to deliberately stop the traffic when the road is empty. 20mph speed limits erected before a series of junctions with 30mph signs after them. The absurd road signs lasted over a year before being removed.